For both professional and amateur boat builders. 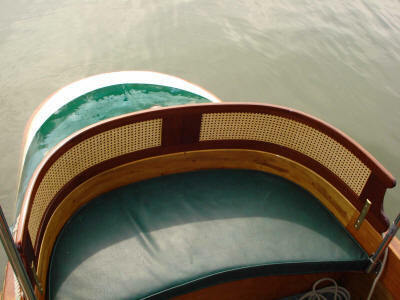 Whether it is hand woven natural cane for the traditionalist or plastic loom cane for ease of maintenance, woven cane looks beautiful on the back of any classic boat. We are in the process of building this page to show the differences between cane materials and the various methods by which it can be attached to the seat - or any other part. Over the next few months we will endeavour to add to this page with ideas and instructions. In the meantime, please email us at: info [at] suzandy.co.uk if you would like any specific information. ←← Loom (prewoven) cane has been glued onto a stained piece of ply with a frame on top to provide a cheap, strong, decorative and low maintenance seat back. 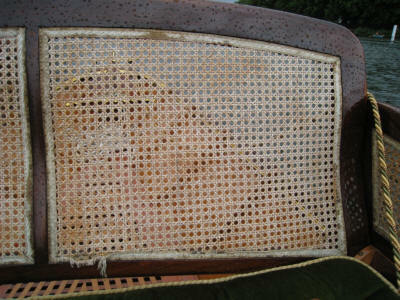 The loom cane on this seat back has been glued and stapled onto the seat back and a braid glued over to hide the edges. Now badly in need of replacing. The biggest drawback of using natural cane is that it deteriorates in wet or damp conditions. This is usually overcome by using several thin coats of varnish. Whilst this is very successful on the backs, it can lead to problems on the seat itself. The 'elasticity' of a caned panel is provided by the slight movement of the cane and varnish prevents this movement making it vulnerable to damage. We have been experimenting with Danish oil and have found that this provides a very good 'weather proofing' whilst still allowing the cane to move. It is also easy to apply and reapply on a regular maintenance basis. Tests are still ongoing. 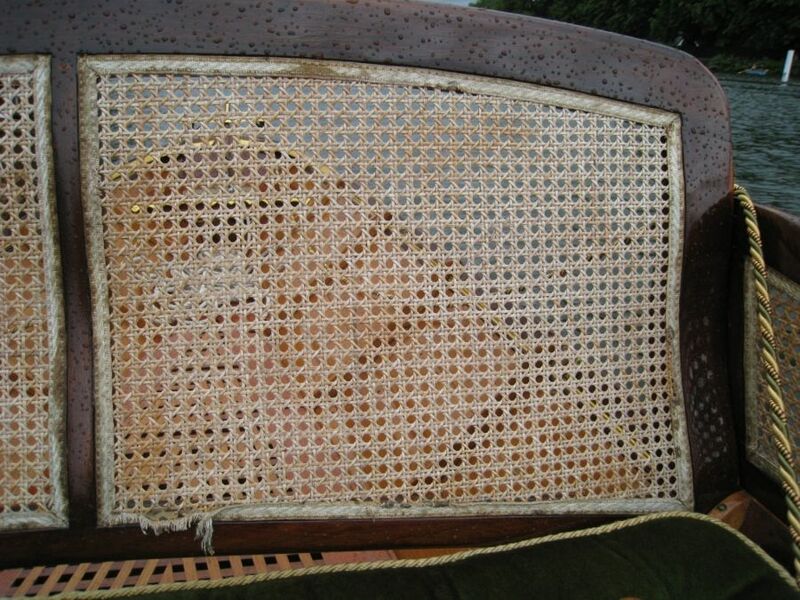 Natural hand cane is woven in the traditional six-way standard pattern onto this seat back frame. The holes are all plugged with centre cane. This panel has been caned in the same way but with plastic 'cane'. Close-up of plastic 'cane'. It's hard to tell the difference.